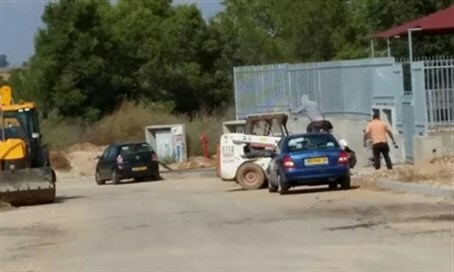 Parents at Ofakim kindergarten refuse to send their children until guards placed to supervise Arab workers right at the gates. As Israel is in the midst of being rocked by an unending onslaught of terror attacks, parents of children at an obligatory kindergarten in the Negev town of Ofakim told Arutz Sheva about a surprising new threat their children were exposed to. The parents decided to launch a strike of the kindergarten, located roughly halfway between Be'er Sheva and Gaza, after it came to their attention that Palestinian Arab workers were conducting infrastructure and development work right adjacent to the kindergarten with absolutely no security present. The fact is all the more troubling given that an Arab terrorist who launched a stabbing attack in Tel Aviv last Thursday worked at an adjacent construction site, and used his central location to stab five victims with a screwdriver. Shai Cohen, a representative of the parents' committee at the kindergarten, told Arutz Sheva that an immediate danger is palpable at the site, where no less than 70 children at the age for obligatory kindergarten attendance are learning. "The kindergartens in the west are in a new area...adjacent to new buildings being built and development conducted in the area," explained Cohen. In the framework of the construction, there are "many Palestinian workers who are working on the site with no security guard." Cohen emphasized that dozens of Palestinian Arab workers are present on the site, and they are working no more than a meter or two from the fence of the kindergarten. He added that in recent days they even have been working on the path leading to the kindergarten itself, all with no supervision. Ahead of last Friday, the parents decided to hold a strike and not send their children to the kindergarten, in a strike that continued on Sunday morning. Cohen emphasized that they are not interested in negotiations - the parents want a simple response in the form of having a security guard posted at the kindergarten, and as long as that doesn't happen the children will not return. The parents are concerned not because of any friction that has yet taken place between them and the workers, but rather out of a desire to prevent any potential danger in the future. "The municipality understands the situation and recognizes the problem, but they pass the problem on from one to the other," complained Cohen. "They tell us that there's no budget in the municipality. We asked that at least in these days in which terror attacks are coming one after the other a guard be stationed." The concerned parent noted that there is a municipal inspection unit which tours the city throughout the day, "and they can bring over one guard for the kindergartens." "Every evening we perform an appraisal of the situation regarding the continuation of the struggle," said Cohen. "We aren't going to send children to kindergartens as long as this is the situation. Every parent for whom the security of their children is important to them will do the same." He noted in conclusion that he reasons the municipality should place responsibility for the security on the construction contracting company, arguing that they should be incorporated into finding a solution to the situation.